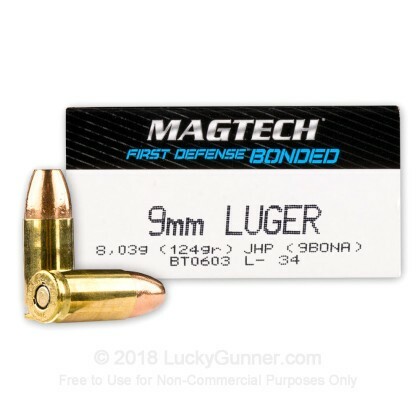 This 9mm Luger ammo, from Magtech's First Defense product line, features a bonded Jacketed Hollow Point projectile. 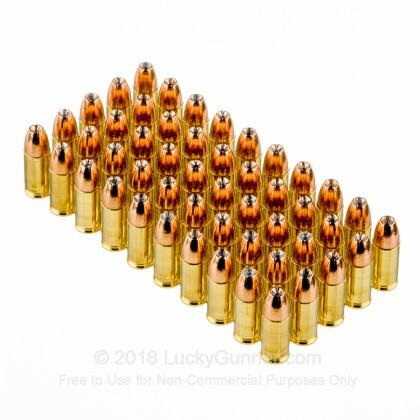 Bonded ammo has become very popular in the hunting and self defense communities because the bullet is much more likely to stay in one piece, which adds to the stopping power of a projectile. 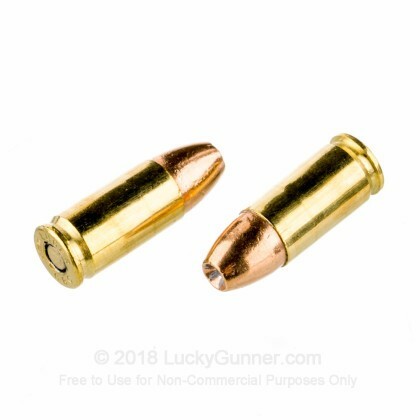 Hollow point ammo is very popular among handgun carriers because the projectile expands upon hitting its target, which reduces the chances of a bullet going completely through its target and greatly increases stopping power. 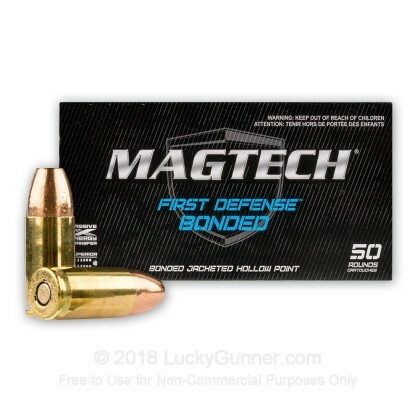 Magtech ammo has become known to handgun owners all over the country as being reliable and quality ammo. 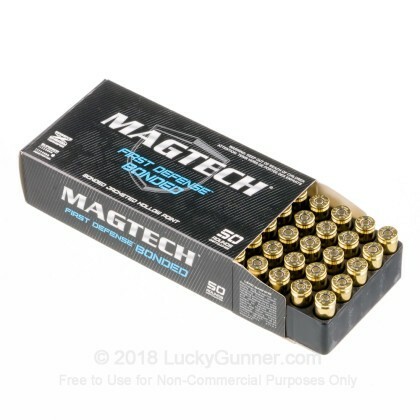 Magtech produces large variety of ammo, so no matter what your ammunition needs are, Magtech has a round for you. This ammo in brass cased, boxer primed, non-corrosive and re-loadable. Ballistic gelatin testing is one of the best methods we have available today for predicting the real-world performance of self-defense ammunition. 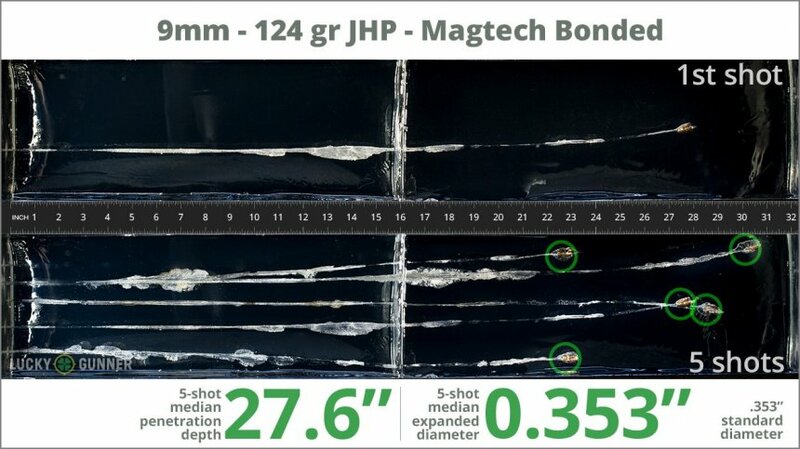 We’ve used Clear Ballistics synthetic gelatin to test over 150 handgun loads, including Magtech 124 Grain. We fired 5 rounds into the gel with a four-layer cloth barrier to determine whether heavy clothing would affect the penetration and expansion characteristics of the bullet. All rounds were fired from a Smith & Wesson M&P9c to reflect the type of short barreled compact pistols that are most commonly carried by legally armed citizens. Above, you can find photos of the actual bullets suspended in the test medium. Images of the recovered bullets are below on the left and high-speed footage of the first bullet fired into the gel is below on the right. All of the data we collected from our test of Magtech 124 Grain is in the chart below that along with diagrams that might give you an idea of how this load compares to other 9mm Luger (9x19) products. 0.90" This ammo: 0.353" Min: 0.32" Median: 0.50" Max: 0.90"
27.6" 0" 5.6" 17.7" 47.5" This ammo: 27.6" Min: 5.6" Median: 17.7" Max: 47.5"